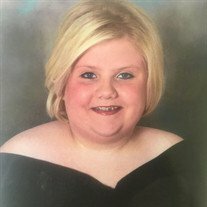 April Deann Bates, 28, passed away Saturday, December 9th, 2017. She was born March 24th 1989 in Little Rock, Arkansas. She was of the Baptist faith. She enjoyed visiting with her friends and family. She was preceded in death by her grandfather, Bill Russell Worley; and her grandparents, Sena Pauline Bates and Delbert Ray Bates. She is survived by her grandmother, Barbara Joann Worley; her father, John Joseph Bates and his wife Patricia; her mother, Jody Dean (Worley) Bates; a special friend, James Nathan Munnerlyn; her sister, Sara Marie Johns; two brothers, Brandon Merell Bates and Joseph Ray Bates; three uncles, Paul Worley and his wife Teresa, David Worley and his wife Lynn; Ron Worley and his wife Anita; one aunt, Maureen Danielson and her husband Ron; numerous nieces, nephews, cousins, extended relatives, and friends; and her dog, Shadow. Visitation will be from 3-4 PM on Thursday, December 14th and the service will begin at 4 PM both at the Willis Funeral Service Chapel with Rev. Tim Bumpous officiating.